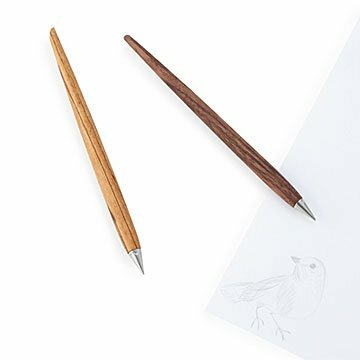 This metal-tipped writing tool makes its mark without ink or pencil lead. What writes without ink or lead? No, this isn't a Zen riddle—it's a writing tool that breaks all the rules. It uses no ink, requires no sharpening like a pencil, and its writing potential never runs out. Drawing on an ancient method of writing with metal, its patented alloy tip lays down a light grey line that doesn't smudge or erase. It works on most paper surfaces and at any temperature or weather condition, making it a great option for field notes. Available with either walnut or zebrawood handles. Made in Germany. This pen can last forever, but is sensitive to falls. Dropping on a very hard flooring surface such as concrete may break the tip.